Perhaps the first message of The Body Card is that we're body-bound and to be thankful for it. Our bodies are to be stroked, hugged and loved. They are for warmth and generosity. So the card tells us that there are times that touching can solve human problems that words cannot. The messages this card sends to us are many-sided. Primarily it must be about health. Mind, body and spirit are interconnected. The body gives us information about our overall health, which can be interpreted as balance and wholeness. 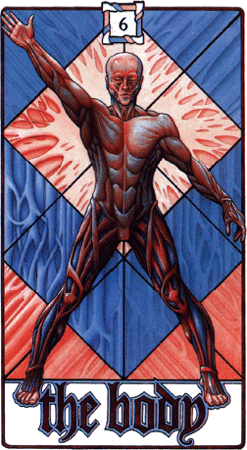 Body cannot be divorced from mind or spirit, so the Body Card is telling you that you should seek an equipoise in your life.